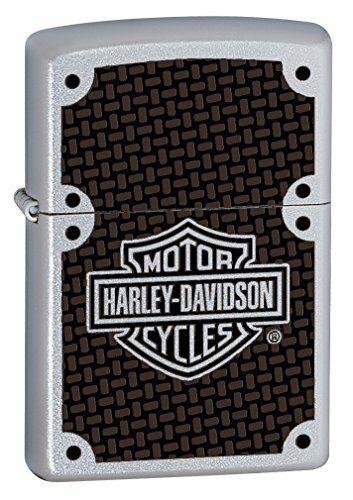 Officially licensed Harley-Davidson Zippo windproof lighter. Imprinted fiber carbon background offsets familiar bar-and-shield logo on satin chrome finish. Refill with Zippo premium lighter fluid for dependable, long-lasting service. Distinctive bottom stamp identifies this lighter as genuine Zippo. Harley, Harley-Davidson and the Bar & Shield Logo are among the trademarks of H-D Michigan, LLC. 2013 H-D. All Rights Reserved. Manufactured by Zippo under license from Harley-Davidson Motor Co.
Made in USA; lifetime guarantee that "it works or we fix it free TM"